Members of the winning team include (from left) Katie Thure, Anyie Li, Abhi Kapuria, Lauren Head, Jennifer Head and Tiffany Lemon. Courtesy photo. While the Patriots and Seahawks were preparing to battle in Phoenix last month, the Emory Global Health Institute (EGHI) hosted a Super Bowl of ideas during its 7th annual Intramural Emory Global Health Case Competition, held at the Rollins School of Public Health on Jan. 31. Twelve multidisciplinary teams comprised of students from across campus participated in the competition. They received the case subject the Monday evening before the Saturday competition, and presented to a panel of judges that included Emory faculty members and business executives from The Coca-Cola Company and Medtronic. Teams were asked to submit applications for a $50 million development loan to the New Development Bank (NDB), an initiative of the economic association of Brazil, Russia, India, China and South Africa known as BRICS. Teams were required to design public health and development proposals that were to be implemented in a country that had been part of the former Soviet bloc. Teams proposed health and development programs tailored to meet the needs of the specific country they selected, which resulted in interventions that addressed a wide variety of health challenges. The winning team’s proposal sought to improve agricultural development and nutritional status in Kazakhstan with a variety of innovative apps that farmers, health care workers and the general population could access via their mobile devices. During their final-round presentation, they also had to incorporate a strategy for effectively dealing with corruption in Kazakhstan to ensure that its program would maintain high ethical standards. One of the goals of the Emory Global Health Case Competition is to bring students together to work on a challenging global health problem while utilizing their different experiences and expertise. “I loved working with my five other team members. I felt everyone was essential to the success of the team and each had a unique contribution to the whole of the project. I also felt I learned a lot about addressing a problem from all sides, including the social, legal and economic sides,” said Jennifer Head. In addition to working on their case presentation, students were able to network with faculty advisors who assisted them with their strategies and the competition’s judges. 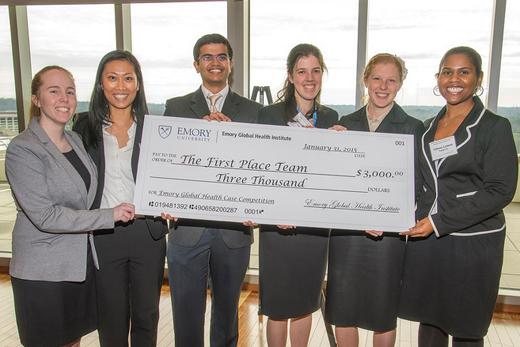 The winning team will go on to compete in EGHI’s International Emory Global Health Case Competition, set for March 28.